Mercury Retrograde is just superstition (2006). Imagine having your own appointment book created for you personally, based upon your unique moment and place of birth, and revealing the cosmic order of your own cycle patterns. Positive interpretations and affirmations help you to re-direct your attention. Plan with foresight, aware of your personal rhythms. WHAT CAN A COSMIC WINDOW DO FOR YOU? The COSMIC WINDOW is a guide made just for you. The brand new COSMIC WINDOW is out in full COLOR, loaded with new features. Check it out! then use any "Faster" link to see our mostly image-free pages. 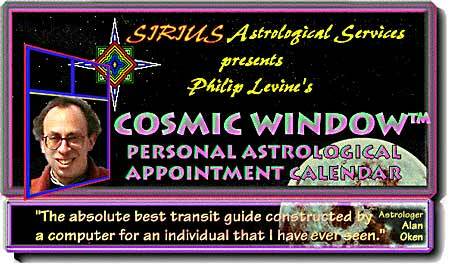 Philip Levine's COSMIC WINDOW is a personal astrological calendar and a guide for self-improvement, a unique and personal companion for our challenging times, a mirror and a container, even a survival tool. SIRIUS Astrological Services has been providing personal appointment calendars and reports since 1985 for the purpose of helping you to live more consciously in tune with the rhythms and cycles of your life. Based upon the actual date, time and place of your birth, our products are the leaders in the field of insightful and psychological tools for daily living and personal growth. Satisfaction is always guaranteed, and knowledge of astrology is not necessary. For general descriptions of each of our products, try the COSMIC WINDOW, CALENDAR of ARCHETYPAL INFLUENCES, LUNAR LIFE CYCLE REPORT, or RELATIONSHIP HANDBOOK. For more details and examples for each product, follow the links in each product description. If you like our web pages and want one of your own, we can make pages for you.